She stands poised and serene on the sea rocks underneath a blustery sky. He stands confident and bold like a fashionable Fauntleroy against a golden grey garden. At first glance…they are similar in subject, stance and appearance. They are similar in color palette, context and composition… in attitude and affluence. But their sameness doesn’t stop there. Embedded beneath the patina of paint and brushstroke runs a strange series of coincidences and ironies that bind both painters and subjects together in an unusual web of wonder. but they also appear on a variety of creative endeavors from ceramic vases to needlepoint pillows from coffee mugs to calendars and most collectibles in-between. As two of the art world’s most commonly printed masterpieces, they are almost always presented as a pair… a portrait of teenagers on the cusp of an adult world. A nod to young love, first love, new love and a symbol of tenderness, confidence, potential and optimism. But you can’t always judge a painting by its presentation. Pinkie and The Blue Boy as a couple are the result of time-worn perception and assumption. Painted by two different artists in two different decades Pinkie and Blue were never meant to be together. It wasn’t until the 1920’s, roughly 150 years after they were painted, that this romantic perception took hold thanks to American railroad tycoon and enthusiastic art collector Henry Edwards Huntington. Purchased in England during the American heyday of British portraiture, Huntington brought these two paintings across the ocean to California where he placed them in his library opposite one another. The general public was then invited to come and take a look. From that moment forward Pinkie and The Blue Boy became associated as a couple forever linked by free association. But oddly enough had Pinkie and Blue met in real-life and lived during the same time frame, they most likely could have been an actual real couple. They had so many similarities in common that relating to each other would have been as breezy as their painted backgrounds. The linking of back stories between not only Pinkie and Blue but also their painters and collector is equally strong. Here are five people entwined in a strange sort of web that is made of parallels in all directions. Let’s look at the links…. 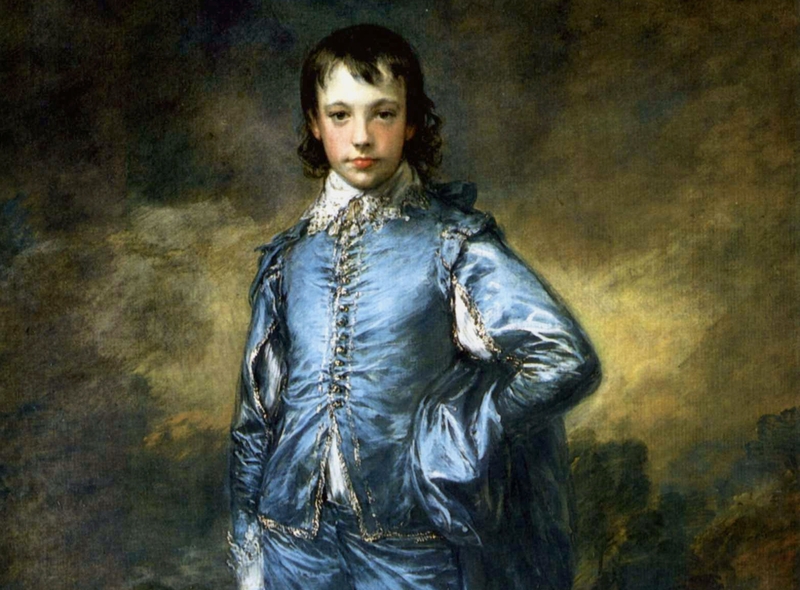 Painted somewhere around 1770 by famed British artist Thomas Gainsborough (1727-1788) The Blue Boy, is thought to be the commissioned portrait of Jonathan Buttall…who came from a wealthy English iron-trading family. At the time the portrait was completed Jonathan was about 18 years old. His father had died two years earlier leaving Jonathan to run the retail iron business and attend to the massive fortune it procured. 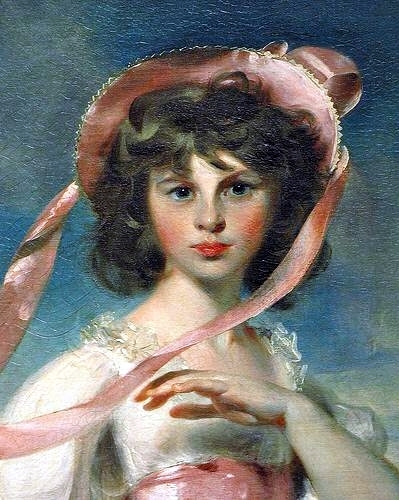 Pinkie, the nickname of Sarah Goodin Barrett Moulton sat for her portrait with equally esteemed English artist Thomas Lawrence in 1794. At the time of the painting she was eleven years old, and also without a father, who had abandoned her family several years earlier. Like Jonathan, Sarah also came from wealthy stock. The Moultons made their fortune in the lucrative business of exporting rum and sugar from Jamaica. At the time of this portrait Pinkie was two years into a stay in England – a dramatic move for educational purposes from her home country of Jamaica. Just like Jonathan adjusting to a new business environment Pinkie was adjusting to a new living environment. They were both wealthy, young, fatherless and undergoing challenging transitions. Although affable and kind-hearted, Jonathan did not turn out to have quite the same knack for financial business savvy that his father possessed. After two decades Jonathan was so loaded down in debt he was forced to file bankruptcy and auction off his belongings including his own portrait. 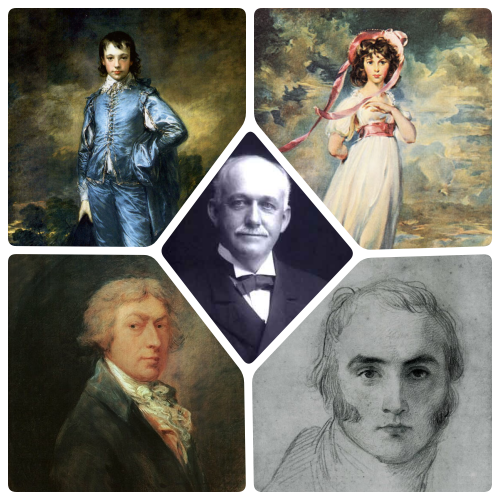 Thomas Lawrence (the painter of Pinkie) was one of the most popular portrait artists of his day and a favorite of the royal courts. He worked constantly and consistently but to the puzzlement of those around him was always in debt. 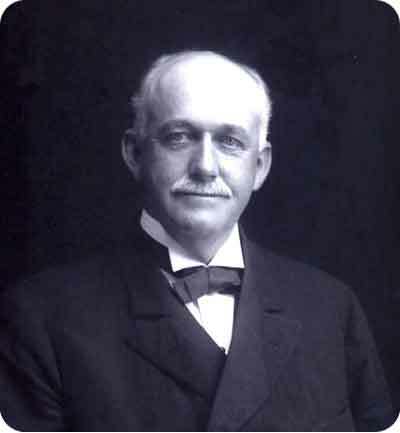 Throughout his career he continually relied on financial support from benefactors and loans from his friends and left little fortune when he died. Gainsborough at the time of the commissioning was looking to break into the theatrical art set of creative London. He appreciated their cultured manner, their love of music and drama and their acceptance of artistic endeavors. But in order to fall in seamlessly with this crowd he felt he had to step up his game as far as skill-level and painting technique. 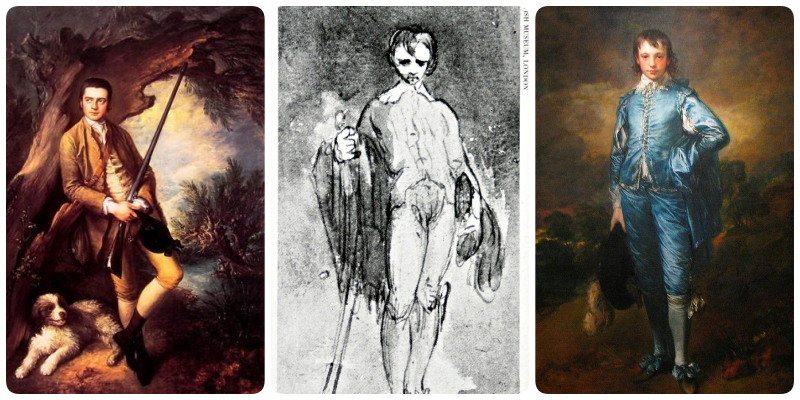 So he studied the style that he most admired, Flemish painter Anthony van Dyck. When Gainsborough met and became friends with the Buttall family he took a particular interest in young Jonathan who enjoyed a similar love of music. 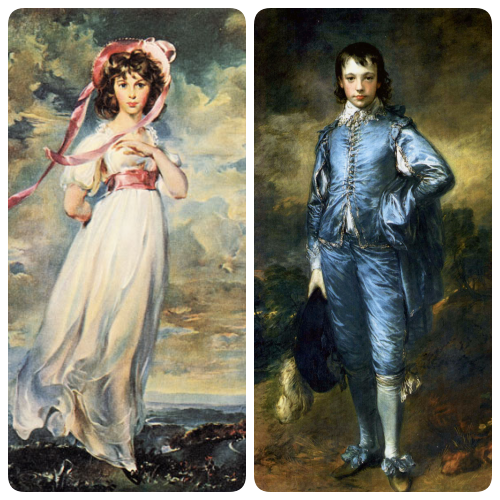 Gainsborough introduced his refined painting style modeled after Van Dyck’s work in his portrait of Jonathan, which became one of England’s most treasured paintings and Gainsborough’s most notable work. Gainsborough treasured his friendship with Jonathan for the rest of his life. Aside from the obvious facts that they were both portrait artists, both named Thomas and both incredibly talented, the two Thomas’ were also big-time supporters of their trade. Separated by a generation in age, Thomas Gainsborough, the elder of the two was a founding member in The Royal Academy of Arts which opened in London in 1768 as an exhibition venue and educational support center for artists. Thomas Lawrence became its 4th president in 1820. Lawrence was an admirer of Gainsborough’s work but is uncertain if the two ever met. 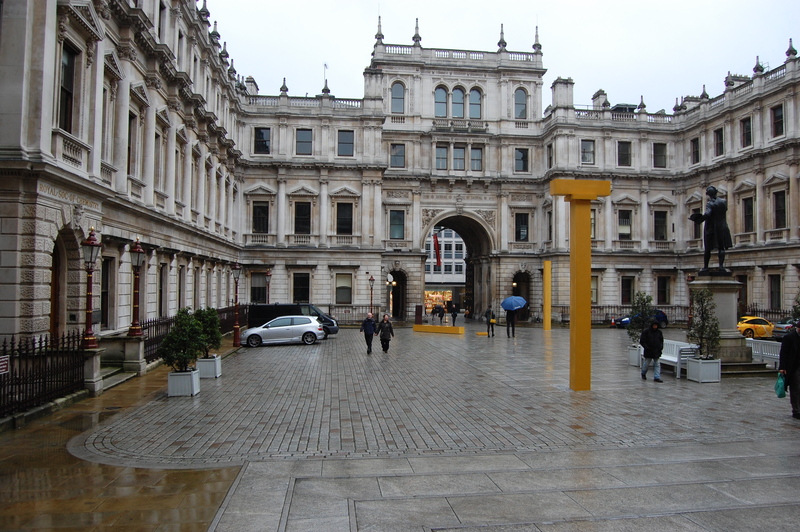 The Royal Academy of Arts in London. Photo by Davis Landscape Architecture. Tragically, Pinkie never made it to adulthood. She died a year after her portrait was painted possibly from complications of an upper respiratory infection. Her painter, Thomas Lawrence also died unexpectedly from a heart attack at the age of 60. In all its varied forms from the passions of collecting to the comfort of friendship, to the dedication of career and to the lofty assumptions of amorous awakenings, Pinkie and The Blue Boy connected not only these five people but also millions of people around the world with one word: love. Art is wonderful in uniting individuals, spawning ideas, energizing imaginations and recording place and time. Antique paintings like Pinkie and The Blue Boy serve not only as an intimate proof of two young lives lived centuries ago but they also serve as a playground for creative thought, intuitive whimsy and a universal need to understand and draw connections. And even though their association is not entirely based in accuracy, the fact that they were blended together in the 1920’s and remain blended together today is a wonderful example of our human race’s need to connect and associate. Sometimes making up a story is more unifying than defining an actual reality. That’s the beauty of art. That’s the beauty of Pinkie and the Blue Boy. 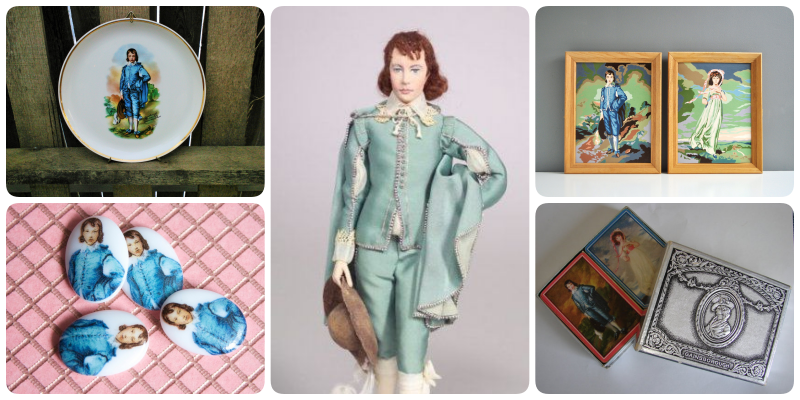 Interested in learning about more vintage art? Check out these two art history books here.